Black Forest Cheesecake has a fudgy brownie bottom topped with creamy smooth cheesecake that’s served with a sweet, tart cherry compote. One of the most decadent and gorgeous pressure cooker cheesecake recipes! It’s so easy in your Insta Pot, too! Eileen, a Pressure Cooking Today reader, recently contacted me asking for help converting a cheesecake recipe to a pressure cooker cheesecake recipe. The recipe was a Kahlua Coffee Brownie Cheesecake recipe from Life Love and Sugar. An Instant Pot is one of the most popular brands of electric pressure cookers. They are easy to use and your Instant Pot can help you create this delicious Black Forest Cheesecake! I loved the idea of a brownie base for the cheesecake instead of a cookie crust. 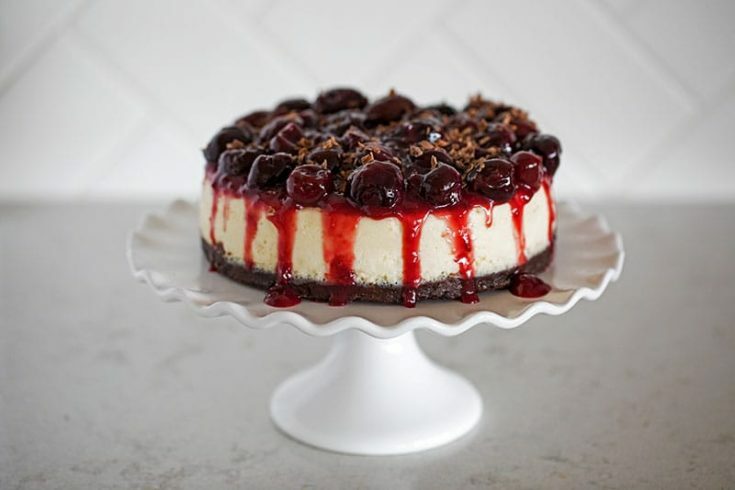 I’m not a big fan of coffee desserts, so instead of a coffee flavored cheesecake, I decided to create a black forest cheesecake with a brownie layer on the bottom, creamy cheesecake in the middle, and topped with my easy-to-make Pressure Cooker Cherry Compote. I served this cheesecake at my twin sons’ 21st birthday party. Everyone loved it! My mother-in-law said she was expecting a chocolate cheesecake when I called it a Black Forest Cheesecake. What do you think? Should I do another version with a chocolate cheesecake middle? Or, is the brownie bottom enough chocolate to count as a Black Forest Cheesecake? 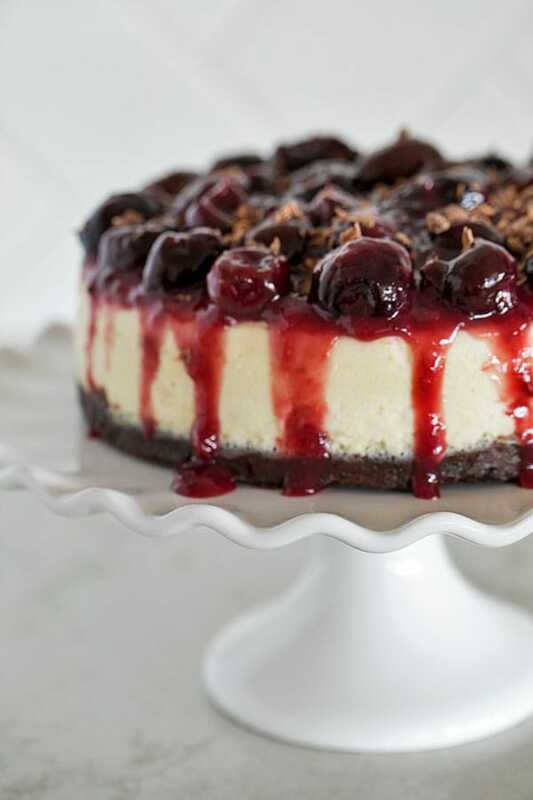 A decadent Pressure Cooker Black Forest Cheesecake with a fudgy brownie bottom topped with a creamy smooth cheesecake and served with a sweet, tart cherry compote. Prepare a 7 inch springform pan by coating it with a non-stick spray. Line with parchment paper, optional. In a small bowl, whisk together flour, cocoa, baking powder and salt; set aside. Whisk together butter, sugar and vanilla in a mixing bowl. Add the egg and mix until well combined. Add the dry ingredients and stir just combined. Spread the batter into the prepared pan. Lock the lid in place. Select High Pressure and set the timer for 7 minutes. When beep sounds, turn off pressure cooker. use a natural pressure release for 5 minutes, and then do a quick pressure release to release any remaining pressure. While brownie is cooking, prepare cheesecake batter. In a mixing bowl beat cream cheese and sugar at medium speed until smooth. Add flour, vanilla and eggs and mix just until blended; don’t over mix. Lock the lid in place. Select High Pressure and set the timer for 25 minutes. When beep sounds, turn off pressure cooker. use a natural pressure release for 10 minutes, and then do a quick pressure release to release any remaining pressure. When valve drops carefully remove lid. If necessary, use the corner of a paper towel to soak up any water on top of the cheesecake. Serve topped with cherry compote and grated chocolate. Note: *Make a sling with a 20 inch piece of aluminum foil, folded three times length wise or use one of these gadgets. Made this yesterday. The good, the cheesecake does not crack. The bad, so incredibly dense. Too dense. I’m thinking I may have to back off the time. Anyone else have issues? I am cooking at altitude. Maybe that had an impact? Hi Lois – cooking at altitude you may have to increase cook times, so I don’t think it would affect this recipe. It’s a very traditional cheesecake recipe, however, if you like a creamier cheesecake, you could reduce the cook time. Or, you may prefer this cheesecake with a shorter cook time and the addition of sour cream. What are the directions for making the Cherry Compote and what chocolate for the shavings would be best? Hi David – here’s a link to the cherry compote https://www.pressurecookingtoday.com/pressure-cooker-cherry-compote/ If you can find a high quality chocolate bar in the baking aisle, Ghiradelli https://www.ghirardelli.com/baking-bars#facet:&productBeginIndex:0&facetLimit:&orderBy:&pageView:grid&minPrice:&maxPrice:&pageSize:& or Scharffenberger https://shop.scharffenberger.com/baking-chocolate/c/scharffenberger@chocolate@baking, that would be idea but most chocolate bars will work. Good afternoon, Barbara…..I have the 6 qt Instant Pot and also the 3 qt…..I purchased the smaller 6 inch springform pan to fit inside the 3 qt for making a cheesecake. My question is can I use your recipe for your cheesecake that fits in the 6 qt using the 6 inch pan instead….if so, I don’t know how long to cook it in the 3 qt Instant Pot. My cheesecakes comes out bakery quality in the 6 qt….fantastic! Hi again Diana (the pink rice lady) – thanks for the reminder 🙂 Often people use the 6 inch pan in the 6 quart without making any changes in cook time. If after the initial time, you can just pressure cook it a little longer if needed. If it fits in the 3 quart with room for steam around it, then the time should be the same as well. Made one today. It is really good. In the directions for mixing the cheese cake batter, you forgot to put to add the flour into that mixture. Thanks for the heads up Sara – I’ve updated the recipe. Hi, I couldn’t find a 7″ pan so I have been using a tall 6″ one. In the past, I haven’t needed to adjust any cooking times when I made other PC cheesecakes (that also specify 7″ pans) –there is an instant pot recipe for a salted caramel one that it amazing–but I had a few issues with yours. The brownie base was still pretty liquid after cooking, so when I poured in the cheese cake, the brownie base ran up the sides of the pan (kind of like a regular crust so I didn’t t mind that). After cooking the cheesecake though, the base was still underdone, kind of gooey, as was the cheesecake in the centre (even though it didn’t giggle after cooking/cooling for an hour). I am using an electric PC (Salton) and I had the cheesecake on a silicone trivet above water level. Any suggestions for troubleshooting? (I am guessing maybe increase brownie cooking time by 50%, say 10 minutes and letting it release pressure naturally for 10′ instead of 5? Appreciate your thoughts. (PS. It was gooey in the middle but the cheesecake tasted so good it is def worth tweaking as I will be making it again). what size pressure cooker is needed to accommodate the pan? I want to buy one and the choice is between 6 and 8 quart. I generally use a 6 quart pressure cooker to test the recipes on Pressure Cooking Today. If you’re feeding a big family, some prefer the 8 quart, but it’s a bit more expensive. For most a 6 quart works well. The 7 inch pan I used to make this cheesecake fits fine in a 6 quart. I am 54 and have never used a pressure cooker because I seen one as a child blow up, so I’m not sure if I can do this, but it looks great. Hi Leisha – sure you can 🙂 The new electric pressure cookers are super safe and super easy. Do you recommend adding more water once you add the batter to the cooked brownie bottom? When I opened the pressure cooker when it was done it was bone dry. Hi Kelly – if a lot of water has evaporated when cooking the brownie bottom, then it is important to add more water. Definitely a good idea to check. Thanks for the reminder. question…do you have a you tube video channel. would love to see all recepies on on video? Hi Claudia – I do have a YouTube channel https://www.youtube.com/channel/UCKczRRMaTL1_16Jp3VGujYg. I don’t have many yet, but plan to add more soon. I just got a recipe for my son’s upcoming birthday! This cheesecake looks so delicious already, I hope it turns out just like it is in the picture. Thank you, Barbara. Thanks Jason – I’m sure it will make a great birthday cake. Enjoy! Looks like Easter Dessert to me!! Pressure cooked cheesecake is the best for sure. They started ordering cheesecake for our dining facilities overseas and the texture is much lighter with a pressure cooker cheesecake. My friends tell me they want mine instead. I’ll need to order cherries for the top like this but all of my cooking is a gift since I can’t really charge for making them. But I’m being told I should sell mine. Would be nice to at least cover my costs. Hi Wayne – so fun that your friends love your pressure cooker cheesecake. Thanks for sharing! I have ordered a new pressure cooker and when it arrives, this is the first thing I’m going to try! OMG gorgeous. This looks wonderful, Barbara! Can’t wait to try it. I think it’s perfectly chocolately the way it is! Yummy! I’m wondering about the Kahlua Coffee Brownie Cheesecake, is your pressure cooker conversion available for it? Thanks Marsha – here’s my advice to Eileen: I would divide the ingredients in half and reduce the cooktime to 1/3 of the times listed in the recipe. Thanks so much! You’re always so kind and helpful! i absolutely love cheesecake, but have never made in a pressure cooker. I might just have to buy one. This cheesecake looks absolutely decadent. Thanks Analida! You’re going to love pressure cooker cheesecake.